Growing up my parents especially my mom, brought us up very close to God. We go to church on Sundays in our Sunday dresses. On Wednesdays, we go to Our Lady of Perpetual Help Shrine and pray the Novena and at home everyday we pray the rosary as a family, kneeling before the altar. Now we are all grown up living on our own with our families far away from each other. I miss those days when we almost do anything together as a family. Here in the US I have two sisters with me but still we are far from each other. To keep the family unity in faith. My sisters and I agreed to start the "Sisterhood of the Traveling Rosary." To bring back tradition of the family in prayer. There are standards to follow. I would like to share them to all of you. 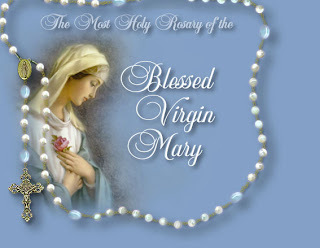 Hoping you will also pray the rosary with your family. 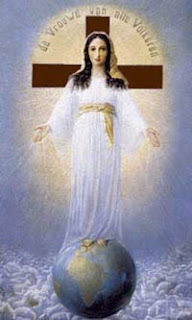 As soon as you receive it, place the picture of Our Lady of All Nation at your altar. As you pray the rosary for seven days, use the white traveling rosary with it, recite the Our Lady of Nations prayer every after mystery and the Litany of the Blessed Virgin Mary after the mysteries. Wear a dress and a veil during the prayer, at best a white one. Light 3 white candles during the prayer. If possible let the whole family join in prayer. Practice the virtues, confess your sins, do penance, attend the Holy Mass and receive the Holy Communion. At the end of the seven day visitation, please send the Rosary packet to the next sister. You can share inspiring stories and experiences of the visitation, comments, suggestions and petitions. Enclose it with the packet. This is the best "sisterhood" I have seen yet! Oh it is hard to be apart from your family. This is a wonderful idea. That was beautiful. You truely are an unstoppable spirit. I missed ya. I haven't blog over the holidays,but I'm back. I hope you'll visit soon. I enjoy your uplifting comments. Our mom does the rosary every day! We used to do the same things as your family..Sunday church, and family praying time together at night before bed time.. Yes, that's a great post. Thanks for the reminder. My mother LOVES Maria. She wears a rosary bracelet always!